It is well known that cells have an outer membrane that is made up of a phospholipid bilayer. This bilayer consists of phospholipids that have ionic polar head groups and two fatty acid chains . These phospholipids orient in such a manner that a bilayer is formed where the polar head groups face outward to the aqueous environment surrounding the cell and inward, facing the aqueous environment within the cell. The fatty acid chains lie within, forming a hydrophobic environment. As proposed by Singer and Nicolson though, scientists now know that this is not the only thing the plasma membrane consists of. In their fluid mosaic model of the plasma membrane, Singer and Nicolson describe the presence of both peripheral and integral proteins . In this case, peripheral proteins are ones that are embedded in the plasma membrane while integral proteins are amphipathic and can integrate through the membrane with both hydrophilic and hydrophobic portions present . A figure of how these proteins lay within the plasma membrane is shown below (Figure 1). 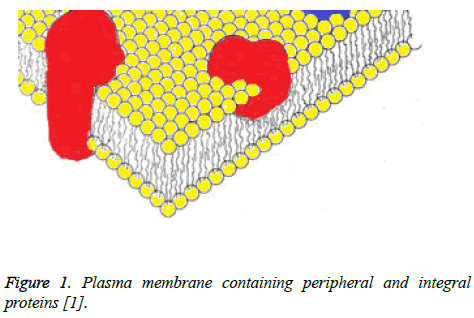 Figure 1: Plasma membrane containing peripheral and integral proteins . It is important to understand the structure and constituents of the plasma membrane for the purposes of this paper because this structure is the basis for the study and use of liposomes in medicine. Formerly referred to as artificial spherules by Gerald, liposomes were noticed to be capable to reflect behaviors of other membrane bound cells and organelles such as erythrocytes, and mitochondria . This observation is an important basis for the study of liposomes now both in biomedical engineering and pharmaceutical fields. Liposomes are small, artificial vesicles that are made up of phospholipids and cholesterol, much like natural plasma membranes . According to Lieberman, these vesicles are self-forming and can form into a single sphere or several concentric spheres . These bilayers are made of phospholipids, such as phosphatidylcholine or saturated phospholipids with long acyl chains that are compatible with cells . Because of their bilayer, liposomes, like other cells, allow for an aqueous environment inside. This potential for holding an aqueous solution is the reason liposomes are often chosen as an area of study for site specific drug delivery. Along with aqueous solutions, liposomes are popular because they can also load lipophilic drugs due to the amphipathic nature of their bilayer membranes. Besides for their drug loading ability, liposomes are chosen as an area of study because of their biocompatibility, but they are also biodegradable and present a low toxicity [5,6]. While the structure of liposomes can be specialized beyond this basic structure, they can be classified more rigidly by size and type. Liposomes can be split into two types with diameter sizes ranging from 0.025 micrometers to 2.5 micrometers [3,7]. As for the types of liposomes, they can either be classified as unilamellar or multilamellar which describes the number of phospholipid bilayers it contains. Unilamellar liposomes consist of a single phospholipid bilayer and can vary greatly in size. Unilamellar liposomes can be further split into small and large unilamellar vesicles (SUVs and LUVs accordingly) . For SUVs, the liposomes have diameters that are smaller than 100 nanometers while LUVs have diameters that range from 100 to 1000 nanometers . Multilamellar liposomes or multilamellar vesicles (MLVs) consist of two or more phospholipid bilayers. While this may seem limitless in terms of how many bilayers the multilamellar liposomes could have, they most commonly have five to 20 concentric rings of the bilayer (also called lamellae) . Multilamellar liposomes, depending on the number of lamellae they have, can range from 100 to 1000 nanometers in diameter . While these liposomal sizes can vary greatly, these sizes and types of liposomes are necessary for determining the circulation halflife of the liposomes as well as the amount of drug that can be loaded into them . Liposomes can be modified in many ways whether this makes it easier for drugs to be loaded onto them, it helps them to reach their target tissue, or it allows the localization of the liposomes to be seen. Depending on the phospholipid chosen to make the liposomes, the fluidity of the liposome can be affected. If unsaturated phosphatidylcholine species are chosen, the liposomal membranes are more permeable to outside materials and experience less stable bilayers . However, if they are made from dipalmitoyl phosphatidylcholine, which is saturated with long acyl chains, the liposomes are more impermeable and rigid . Liposomes also have the ability to be enhanced with other surface modifications. This makes them attractive in drug delivery because targeting moieties can be added to help target specificity . Unlike other drugs, liposomes have the ability to be modified in a way in which they only affect a specific area or mass in the body. Adding probes to these liposomes is what allows for this target specificity. One specific way in which liposomes can be modified is by the addition of PET, SPECT, or MRI probes. The addition of these probes allows for image-guided drug delivery . A schematic of such a liposome can be seen in Figure 2 with the probes attached to the surface of the liposome. 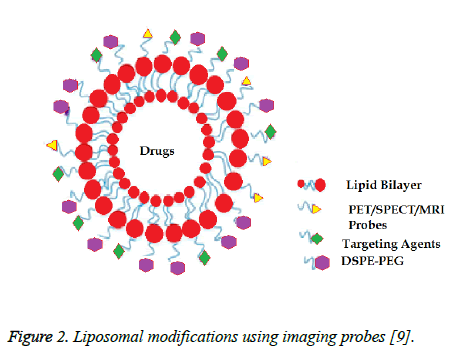 Figure 2: Liposomal modifications using imaging probes . Another important consideration is how to make the liposomes last longer in the body. Such a modification to improve and protect the liposome is the addition of polyethylene glycol (PEG) [6,9,10]. These PEGylated liposomes have a protective hydrophilic layer so that liposomes can better enter areas of the body such as the reticuloendothelial system [9,11-13]. This layer helps to increase the circulation time of the liposomes as well as protect the drug inside from degrading mechanisms of the cells and tissues they are in . This PEGylation of liposomes has been shown to work in a study on cancer treatment in dogs and cats. In this study, it was seen that these liposomes with doxorubicin worked at reducing tumors in cats . Another study shows that doxorubicin loaded onto phosphatidyldiglycerol thermosensitive liposomes worked as a treatment for soft tissue sarcoma in cats as well . A similar study also shows doxorubicin loaded liposomes as a potential treatment for sarcoma in cats . Doxorubicin has additionally been noted as a possible treatment for feline injection site sarcomas when coupled with radiation therapy . In this trial, doxorubicin was loaded onto PEGylated liposomes as in other studies . The improvement in delivery for these liposomes is important, and their ability to avoid some of the body's natural defenses to foreign material is why they have been named as stealth liposomes. As mentioned before, liposomes are subject to the body's defense systems because they are foreign material. More specifically, liposomes are targeted by the mononuclear phagocytic system upon identification by plasma proteins on the body's cells . Once uptaken by the phagocytes, liposomes would be destroyed and removed as waste from the body. As mentioned before, these liposomes are coated with polyethylene glycol which protects the liposomes from targeting by phagocytic cells such as macrophages. With this specialized ability to avoid destruction by the immune system, these stealth liposomes are preferred when it comes to drug delivery. From this avoidance, the liposomes are allowed to circulate within the body longer, which could improve the amount of drug they are able to deliver to the area of interest. However, it is a concern that these cells can escape from blood circulation, which may decrease their effectiveness . While there are concerns for these liposomes, they are still useful in drug delivery, which is the main area of study for liposomes. To truly understand why liposomes are so popular to study though, one must consider the clinical applications of these drug-loaded vesicles. While this paper focuses on liposome use in drug delivery, liposomes may also be used in gene therapy . Within drug delivery, these liposomes can be used as drug carriers that can target specific tissues, subcellular compartments, or malignant cells . As for this targeting, liposomes have been used in treatments against inflammation, fungi, and cancer . Since they can target inflammation, they could potentially be used in treatment of prion diseases as these are often associated with the pro-inflammatory response of microglial cells . As mentioned before, some drug-loaded liposomes have been tested and been seen to reduce tumor size in cats . Liposomes are also studied extensively because beyond targeting specific cell types, they are also able to target intracellular components as well. In fact, one study uses the liposomes' ability to move to the intracellular environment in order to target Mycobacterium tuberculosis that had been engulfed by macrophages . This ability for liposomes to enter the intracellular compartment is an important feature that makes liposomes a popular area of study, especially in targeting to macrophages as will be discussed later. There are many documented ways in which liposomes can be synthesized, and many of these methods can even be combined to produce the various types of liposomes. These methods can be divided into two categories that include active loading techniques and passive loading techniques . 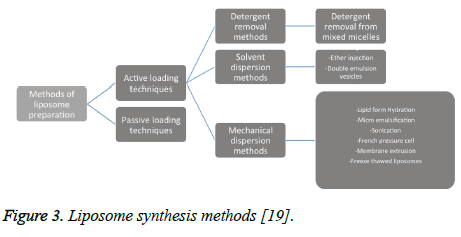 Passive loading techniques can then be further split into mechanical dispersion methods, solvent dispersion methods, and detergent removal methods . The figure of a liposome synthesis chart below gives a good overview of liposome synthesis methods that will be discussed further (Figure 3). Figure 3: Liposome synthesis methods . Sonication: Sonication is a very simple and widely used method for preparing liposomes. It is especially useful for synthesizing small unilamellar vesicles . In this method of preparation, multilamellar vesicles are put in either a bath sonicator or are disrupted using a probe sonicator . Other protocols utilize phospholipids from various animal parts which are mixed, dried, resuspended, then sonicated to produce the small unilamellar vesicles . The main issues with using sonication as a preparation method is that there is a small internal volume available to hold drugs, and the phospholipids can become degraded under sonication . Lipid-film hydration: Another mechanical dispersion method of liposome synthesis is by lipid-film hydration. This method is one of the most common preparation techniques used . This specific method can be accomplished by hand-shaking, non-hand-shaking, and freeze drying . In this method of preparation, a solution of phospholipids and cholesterol is added to a flask . Once added, the organic solvent of this solution is completely evaporated out, leaving a thin film of the phospholipids and cholesterol, which make up the membrane [21-23]. Once completely evaporated, the solution is hydrated using phosphate buffer solution and mixed well [22,23]. This hydration of the thin film along with vortexing and sometimes sonication should produce liposomes. In one specific protocol, this can be combined with the membrane extrusion method to obtain small unilamellar vesicles from multilamellar vesicles . However, one issue with this preparation method is that traces of the organic solvent can sometimes be found in the final product . Membrane extrusion: Membrane extrusion methods for synthesizing liposomes are necessary for obtaining more homogenous mixtures of small unilamellar vesicles as it allows for greater size control and reproducibility . In order to extrude the liposomes, polycarbonate membranes are utilized with a specific pore size . From here, a prepared liposome suspension is passed through the membrane(s) several times . From this, extrusion is a method that should be used if a more homogenous mixture of liposomes is needed; however, since it still produces small unilamellar vesicles, its carrying efficiency is lowered due to the smaller available volume within the vesicle. French pressure cell: The French pressure cell method for producing liposomes via mechanical dispersion produces small unilamellar vesicles from multilamellar vesicles much like the extrusion method. Rather than utilizing membranes though, the French pressure cell device uses a small orifice to pass the desired liposomes through . In one report, the suspension was passed through the orifice at 20,000 psi which resulted in 70 percent of the resulting solution having the desired small unilamellar vesicles . This report saw an increase to 90 percent when the resulting solution from the first extrusion was put through the orifice again . While this method was not 100 percent efficient, no other methods are, and in this report, it was found that this 90 percent efficiency could be increased by removing remaining multilamellar vesicles via centrifugation . This method seems to be a similar alternative to membrane extrusion but can possibly result in a more homogenous final solution of small unilamellar vesicles. Freeze-thawed: The freeze-thaw method under mechanical dispersion techniques is a protocol used to create large unilamellar vesicles from small unilamellar vesicles . By freezing the small unilamellar vesicles then thawing them several times, the vesicle membranes are able to aggregate to create the large vesicles . One of the difficulties with this method though is that ice crystals can damage the lipid bilayers during freezing . Because of this, new methods for protecting the bilayers during freezing are of interest . However, it has been found that this method of freeze-thawing liposomes aids in the production of liposomes when they are freeze-dried . Ethanol injection: In the ethanol injection method for solvent dispersion, a lipid solution containing ethanol is rapidly injected into a buffer, such as water . This method is often used because of its ability to produce small vesicles using a relatively simple protocol. One such protocol utilizing ethanol injection requires that phospholipids and cholesterol, in appropriate amounts, are dissolved in ethanol. From here, this solution is injected/pumped into distilled water . This method is simple to follow, and the liposomes are easily separated out by evaporating the excess ethanol and water . One challenge with this method is that it is difficult to obtain a homogenous mixture of same-sized liposomes as compared to other methods . Double emulsion: The double emulsion technique for synthesizing liposomes is similar to that of ethanol injection in that it utilizes solvents to produce the liposomes. However, in double emulsion, two different solvents are used to create a more homogenous solution of liposomes than ethanol injection can provide . In this method of synthesizing liposomes, phospholipids are added to ethanol as in ethanol injection. Once this solution is agitated, it is then added to a second solvent that contains glycerin . Another method of double emulsion involves using water-in oil-in water methods for encapsulating liposomes . A schematic for this method can be seen in Figure 4 below. This method helps to encapsulate delicate liposomes that could otherwise be easily degraded . This method is preferred to just ethanol injection because it can produce a more homogenous mixture of vesicles, and it potentially provides a method for preparing liposomes on an industrial scale because of its ability to transform high concentrations of phospholipids into high quantities of liposomes . Double emulsion is also favorable because it encapsulates the liposomes, controlling the release of the drug as well as protecting the liposomes in harsh environments, such as the gastrointestinal tract [29,30]. Figure 4: Water-in oil-in water double emulsion schematic . Ether injection: The ether injection method is similar to the ethanol injection method for synthesizing liposomes. However, instead of ethanol, the phospholipids and cholesterol are dissolved in a solution of ether or ether-methanol . Also, rather than injecting this solution into water rapidly, it is gradually injected into water . Once these are added, the solution is heated above the boiling point of ether to remove it from solution which leaves only the liposomes . This method for preparing liposomes is favorable because it eliminates a step of liposomes entering a multilamellar phase, and it is fairly simple to create a homogenous mixture . Larger, unwanted vesicles left in the solution are easily filtered out . Ether injection, like ethanol injection and double emulsion, is a simple protocol to synthesize liposomes. Reverse phase evaporation is a method of preparing liposomes which creates a large volume:lipid ratio . This high volume is important because these liposomes would be able to carry a higher volume of drug to their targets. Reverse phase evaporation is also appealing because various organic solvents can be used. However, traces of these solvents can often be found in the liposomes even after evaporation . This method forms liposomes using centrifugation of inverted micelles through the barrier between an organic solvent and an aqueous solution . The addition of detergents to a solution containing phospholipids and cholesterol leads to the formation of mixed micelles or vesicles of various shapes and sizes . However, with the removal of detergent, the size of these mixed micelles can be increased. At a critical ratio of detergent to lipid though, the lipids will form liposomes . Detergent removal is appealing because this method can effectively produce unilamellar liposomes. However, detergents have drawbacks such as they can lead to degradation of macromolecules . It is important then in this method that the detergent is effectively removed from the functioning liposome. This detergent can be removed using many different methods that include, but are not limited to dialysis, column chromatography, and dilution. Dialysis is one method in which detergent monomers and micelles can be separated from mixed micelles . This dialysis has been reported to work using both flat membranes and hollow fibers . This dialysis method utilizes the diffusion of the detergent across the dialysis membrane in order to remove it from solution . However, in order to maximize the removal of detergent, a method such as crossflow filtration may be used. This filters the solution under pressure so that the detergent is removed faster . Column chromatography is a concept that utilizes a stationary phase and a mobile phase to separate contents by size. In this, as the mobile phase moves, contents of varying sizes get stuck at different points in the stationary phase. As for detergent removal, as the column is run, mixed micelles are separated from the detergent . This results in pure micelles and liposomes forming on the stationary phase since they are now separated by size. The dilution method for removing detergent relies on the diffusion of the detergent from the mixed micelles into the aqueous solvent . In this case, the removal of detergent from the vesicles can be determined by the dilution factor . As the solution is diluted, the liposome dispersions become more concentrated, which is how they can better be isolated . From here, they can be washed or put through dialysis to obtain the liposome solution . Liposomes are an area of focus when it comes to drug delivery because they are able to be modified in ways that give them the capability to target specific tissue and cell types as well as enter the intracellular environment of these cells. Macrophages are often madea target of liposomes because they can contribute to the progression of diseases . This progression of disease is due to the release of pro-inflammatory cytokines by macrophages [40,41]. Since macrophages can also release anti-inflammatory cytokines upon activation, studies are focused on drug delivery that will facilitate this shift from inflammatory to anti-inflammatory to reduce disease progression [40,41]. In one study, researchers focused on using hyaluronan modified liposomes to target macrophages without an inflammatory response. Since it was previously found that multilamellar liposomes are taken up by the reticuloendothelial system where macrophages can be found, this study utilized multilamellar liposomes . It is important to note too that liposomes are useful especially in anti-inflammatory studies because they do not elicit inflammatory responses themselves. It was found that macrophages did show a higher affinity and actually took up multilamellar liposomes more than they did unilamellar liposomes . The importance of this finding was that targeting of liposomes to macrophages was successful, and since the macrophages actually took up the liposomes, they could eventually be used to target subcellular components of the macrophage . While this study supports the capability of targeting liposomes to macrophages, other studies focus on a specific protein associated with macrophages to target them. One study specifically looks at CD163 which is expressed in macrophages that are found at the site of inflammation . In this study, it was found that by targeting this protein, intake of liposomes by macrophages was increased . Ultimately, it supports the use of stealth liposomes to target specific proteins associated with macrophages to help control inflammatory response . This is an important finding because not only can the macrophages take up the liposomes and their associated drugs, but they can now be targeted based on specific proteins present in macrophages at sites of inflammation. This is an important step in targeting and actually eliciting a response from macrophages. This response was studied using mice with non-alcoholic fatty liver disease. Non-alcoholic fatty liver disease, also known as NAFLD, is associated with macrophage inflammation within the liver tissue . In this study, liposomes containing curcumin and calcitriol were injected into these diseased mice, and the response by macrophages was assessed. It was found that the macrophages did take up the liposomes, and researchers noticed both an in vivo and in vitro reduction in proinflammatory responses by macrophages . This finding supports the use of liposomes in reducing the inflammatory response by macrophages in diseased animals, which could eventually lead to clinical applications for human disease. Another possible application to human disease is the targeting of these liposomes to atherosclerotic plaque in blood vessels. A study of how liposomes are absorbed by atherosclerotic plaque revealed that anionic liposomes were colocalized with macrophages . This could be seen by using a fluorescent marker on the liposomes . Once colocalized with the macrophages, the results of this study suggest that the liposomes are taken up by the human coronary endothelial cells by clathrin-mediated endocytosis . Based on these results, liposomes could potentially be an effective treatment of atherosclerosis by using macrophages as the target of the liposomes. Once the liposomes are taken up by the endothelial cells, drug treatment could be used to reduce plaque within the blood vessel. As mentioned before, these liposomes may also be used to target the intracellular environment of the macrophages, such as macrophages that have engulfed bacteria like Mycobacterium tuberculosis . Because of studies like these, there might be novel approaches to combating intracellular bacterial diseases through the use of liposomes . A similar study uses a liposome like vessel called a lipopolymersome to target macrophages intracellularly . In this study, the focus is to provide a therapy for visceral Leishmaniasis which is a tropical infectious disease caused by a parasite called Leishmania donovani . This parasite proliferates within macrophages, which is why this lipo-polymersome is being used to target the macrophages' intracellular environment . However, unlike liposomes, this lipo-polymersome was synthesized using glycol chitosan as a hydrophilic shell and stearic acid as a hydrophobic core, forming a monolayer . Similar to the liposome though, cholesterol was added within the monolayer . Ultimately, this study finds that this lipo-polymersome improves the chemotherapy of intramacrophage infections . Based on the studies above, it can be said that liposomes may be effective at targeting both extracellular markers on cells and intracellular environments as well. Liposomes are small vesicles with membranes similar to those of animal cells. These similarities along with the ability for membrane modification allows for liposomes to target cells of the body while escaping cells of the immune system. This with their ability to carry drugs makes liposomes strong candidates for cell or tissue specific drug delivery. There are many options for synthesizing liposomes, each with differences in resulting liposome size and carrying capacity, which is important to consider for effective drug delivery. The most interesting aspect of these liposomes though is their ability to specifically target cells such as macrophages. Macrophages are not only associated with inflammatory diseases, but can also can participate in tissue remodelling. During normal healing, M1 macrophages are predominant removing debris, infection and damages cells. Macrophages transition to M2 phenotype is necessary to promote healing and regeneration. Dysregulation of M1 or M2 expression has been associated with major diseases including chronic wounds (diabetic, pressure and venous ulcers), chronic obstructive pulmonary disease, infection, atherosclerosis, cancer, asthma, Parkinson's disease, Alzheimer's disease and cancer. Many polyphenols have been shown to be effective in M1 to M2 transiitotion and using liposomes as a carrier would be very interesting for in vivo studies. Macrophages are very plastic cells. Transdifferentiation of macrophages into a desired cell can be a very interesting approach in inflammatory diseases. Possibly transdifferentiaiaon of macrophages into functional osteoclasts in vascular calcification, transdifferentiaiaon of macrophages into Chondrocytes in Osteoarthritis and etc. Finally, it is because of this possibility of both external and internal targeting of macrophages that liposomes are a continuing interest for drug targeting, immunotherapy and immunoengineering. Singer SJ, Nicolson GL. The fluid mosaic model of the structure of the cell membrane. Science 1972; 175: 720-731. Sessa G, Weissmann G. Phospholipid Spherules (Liposomes) as a model for biological membranes. J Lipid Res 1968; 9: 310-318. Akbarzadeh A, Rezaei-Sadabady R, Davaran S, Joo SW, Zarghami N, Hanifehpour Y, Nejati-Koshki K. Liposome: classification, preparation, and applications. Nanoscale Res Lett 2013; 8: 1-9. Lieberman HA, Rieger MM, Banker GS. Pharmaceutical dosage forms: disperse systems. Marcel Dekker, New York 1998. Johnston MJW, Semple SC, Klimuk SK, Ansell S, Maurer N, Cullis PR. Characterization of the drug retention and pharmacokinetic properties of liposomal nanoparticles containing dihydrosphingomyelin. BBA-Biomembranes 2007; 1768: 1121-1127. Zabielska-Koczywas K, Lechowski R. The use of liposomes and nanoparticles as drug delivery systems to improve cancer treatment in dogs and cats. Molecules 2017; 22: 1-14. Bobo DRK, Islam J, Thurecht KJ, Corrie SR. Nanoparticle-based medicines: a review of FDA-approved materials and clinical trials to date. Pharm Res 2016; 33: 2373-2387. Hussain H. Development of liposomal curcumin for vaginal drug delivery. Drug Transport and Delivery Research Group 2010. Lamichhane NU, DSouza TS, Simone WD, Raghavan CB, Polf SR, Mahmood JJ. Liposomes: clinical applications and potential for image-guided drug delivery. Molecules 2018; 23: 1-17. Shaheen SM, Ahmed FRS, Hossen N, Amran S, Islam A. Liposome as a carrier for advanced drug delivery. Pak J Biol Sci 2006; 9: 1181-1191. Yang T, Choi MK, Cui FD, Kim J, Chung SJ, Shim CK, Kim DD. Preparation and evaluation of paclitaxel-loaded pegylated immunoliposome. J Control Rel 2007; 120: 169-177. Klibanov AL, Maruyama K, Torchilin VP, Huang L. Amphipathic polyethyleneglycols effectively prolong the circulation time of liposomes. FEBS Lett 1990; 268: 235-237. Klibanov AL, Maruyama K, Beckerleg AM, Torchilin VP, Huang L. Activity of amphipathic poly(Ethylene glycol) 5000 to prolong the circulation time of liposomes depends on the liposome size and is unfavorable for immunoliposome binding to target. Biochim Biophys Acta 1991; 1062: 142-148. Zimmermann K, Hossann M, Hirschberger J, Troedson K, Peller M, Schneider M, Lindner LH. A pilot trial of doxorubicin containing phosphotidyldiglycerol based thermosensitive liposomes in spontaneous feline soft tissue sarcoma. Int J Hypertherm 2017; 33: 178-190. Poirier VJ, Thamm DH, Kurzman ID, Jeglum KA, Chun R, Obradovich JE, Vail DM. Liposome-encapsulated doxorubicin (Doxil) and doxorubicin in the treatment of vaccine-associated sarcoma in cats. J Veter Int Med 2002; 16: 726-731. Petznek H, Kleiter M, Tichy A, Fuchs-Baumgartinger A, Hohenadl C. Murine xenograft model demonstrates significant radio-sensitising effect of liposomal doxorubicin in a combination therapy for feline injection site sarcoma. Res Veter Sci 2014; 97: 386-390. Wang J, Zhao D, Pan B, Fu Y, Shi F, Kouadir M, Zhou X. Toll-like receptor 2 deficiency shifts PrP106-126-induced microglial activation from a neurotoxic to a neuroprotective phenotype. J Mol Neurosci 2014; 55: 880-890. Hopkinson D. Bioresponsive liposomes to target drug release in alveolar macrophages. EThOS 2017. Dua JS, Rana AC, Bhandari AK. Liposome: methods of preparation and applications. Int J Pharm Stud Res 2012; 14-20. Mendez R, Banerjee S. Sonication-based basic protocol for liposome synthesis. Lipidomics 2017; 255-260. Ghanbarzadeh S, Valizadeh H, Zakeri-Milani P. Application of response surface methodology in development of sirolimus liposomes prepared by thin film hydration technique. Bioimpacts 2013; 3: 75-81. Zhang H. Thin-film hydration followed by extrusion method for liposome preparation. Liposomes Meth Protocols 2017; 1522: 17-22. Varona S, Martin A, Jose Cocero M. Liposomal incorporation of lavandin essential oil by a thin-film hydration method and by particles from gas-saturated solutions. Industr Eng Chem Res 2017; 50: 2088-2097. Guo P, Huang J, Zhao Y, Martin CR, Zare RN, Moses MA. Nanomaterial preparation by extrusion through nanoporous membranes. Small 2017; 14. Hamilton RL, Goerke J, Guo LSS, Williams MC, Havel RJ. Unilamellar liposomes made with the French pressure cell: a simple preparative and semiquantitative technique. J Lipid Res 1980; 21: 981-992. Jangle RD, Thorat BN. Effect of freeze-thawing study on curcumin liposome for obtaining better freeze-dried product. Drying Technol 2013; 31: 996-974. Jaafar-Maalej C, Diab R, Andrieu V, Elaissari A, Fessi H. Ethanol injection method for hydrophilic and lipophilic drug-loaded liposome preparation. J Liposome Res 2010; 20: 228-243. Sala M, Miladi K, Agusti G, Elaissari A, Fessi H. Preparation of liposomes: a comparative study between the double solvent displacement and the conventional ethanol injection-from laboratory scale to large scale. Colloids Surface Physicochem Eng Aspect 2017; 524: 71-78. Liau JJ, Hook S, Prestidge CA, Barnes TJ. Research paper: a lipid based multi-compartmental system: liposomes-in-double emulsion for oral vaccine delivery. Eur J Pharmac Biopharm 2015; 97: 15-21. Ruan G, Ng JK, Feng SS. Effects of polymer, organic solvent and mixing strength on integrity of proteins and liposomes encapsulated in polymeric microspheres fabricated by the double emulsion process. J Microencaps 2004; 21: 399-412. Caschera F, Lee JW, Ho KKY, Liu AP, Jewett MC. Cell-free compartmentalized protein synthesis inside double emulsion templated liposomes with in vitro synthesized and assembled ribosomes. Chem Commun (Cambridge, England) 2016; 52: 5467-5469. Deamer DW. Preparation and properties of ether-injection liposomes. Ann N Y Acad Sci 1978; 308: 250-258. Cortesi R, Esposito E, Gambarin S, Telloli PM, Nastruzzi EC. Preparation of liposomes by reverse-phase evaporation using alternative organic solvents. Microencapsulation 1999; 16: 251-256. Szoka F, Papahadjopoulos D. Procedure for preparation of liposomes with large internal aqueous space and high capture by reverse-phase evaporation. Biochemistry 1978; 75: 4194-4198. Schubert R. Liposome preparation by detergent removal. Methods Enzymol 2003; 367: 46-70. Wacker M, Schubert R. From mixed micelles to liposomes: critical steps during detergent removal by membrane dialysis. Int J Pharm 1978; 162: 171-175. Peschka R, Purmann T, Schubert R. Cross-flow filtration-an improved detergent removal technique for the preparation of liposomes. Int J Pharm 1978; 162: 177-183. Holzer M, Barnert S, Momm J, Schubert R. Preparative size exclusion chromatography combined with detergent removal as a versatile tool to prepare unilamellar and spherical liposomes of highly uniform size distribution. J Chromatogr A 2009; 1216; 5838-5848. Jiskoot W, Teerlink T, Beuvery E, Crommelin D. Preparation of liposomes via detergent removal from mixed micelles by dilution. Pharmaceutisch Weekblad 1986; 8: 259. Etzerodt A, Maniecki MB, Graversen JH, Moller HJ, Torchilin VP, Moestrup SK. Efficient intracellular drug-targeting of macrophages using stealth liposomes directed to the hemoglobin scavenger receptor CD163. J Control Rel 2012; 160: 72-80. Glucksam-Galnoy Y, Zor T, Margalit R. Hyaluronan-modified and regular multilamellar liposomes provide subcellular targeting to macrophages, without eliciting a pro-inflammatory response. J Control Rel 2012; 160: 388-393. Maradana MR, Yekollu SK, Zeng B, Ellis J, Clouston A, Miller G, OSullivan BJ. Immunomodulatory liposomes targeting liver macrophages arrest progression of nonalcoholic steatohepatitis. Metabolism 2018; 78; 80-94. Zhaorigetu S, Rodriguez-Aguayo C, Sood AK, Lopez-Berestein G, Walton BL. Delivery of negatively charged liposomes into the atherosclerotic plaque of apolipoprotein E-deficient mouse aortic tissue. J Liposome Res 2014; 24: 182-190. Ponzoni M, Pastorino F, Di Paolo D, Perri P, Brignole C. Targeting macrophages as a potential therapeutic intervention: impact on inflammatory diseases and cancer. Int J Mol Sci 2018; 19. Gupta PK, Asthana S, Jaiswal AK, Kumar V, Verma AK, Shukla P, Mishra PR. Exploitation of lectinized lipo-polymerosome encapsulated amphotericin B to target macrophages for effective chemotherapy of visceral leishmaniasis. Bioconjugate Chem 2014; 25: 1091-1102.